Authorities in China say a project to build a waste water pipeline in the city of Qidong has been scrapped after a protest over pollution. Demonstrators took to the streets of the city, north of Shanghai, and ransacked local government offices. They said the pipeline, proposed as part of a paper-making company, would pollute their coastal waters. China has seen rising anger about environmental damage after three decades of rapid economic growth. The thousands of protesters overturned cars as well as storming the local government offices and throwing documents from the windows. Items which the protesters allege are often received as bribes by officials - such as wine - were also seized from the offices, reports say. One local official was even reported to have been stripped of his shirt by angry protesters. Users of the Chinese microblogging site Weibo said that having found luxury items in the government offices, demonstrators wanted to know what brand of clothing local Party Secretary Sun Jianhua was wearing. On discovering it was an expensive Italian brand, they are said to have stripped him to the waist and tried to make him wear shirt which bore an anti-pollution slogan. Local authorities had tried to appease local anger by suspending construction on the plant, but protesters rejected this. "If the government really wanted to stop this project, they should have done it right from the beginning. 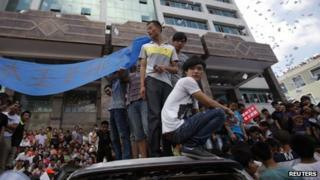 At this point they are too late," 17-year-old protester Xi Feng told Reuters. Earlier this month plans for a copper plant in Sichuan province were halted after thousands clashed with police. Demonstrators in such cases are becoming more outspoken, and their protests better organised and more effective. Analysts say this is a measure of social tensions in China as the Communist Party prepares for a leadership transition later this year.